This is for Ruth - I've just read on Facebook that she feels she no longer has enough time for her garden in Provence due to all her other commitments and is thinking of giving it up. 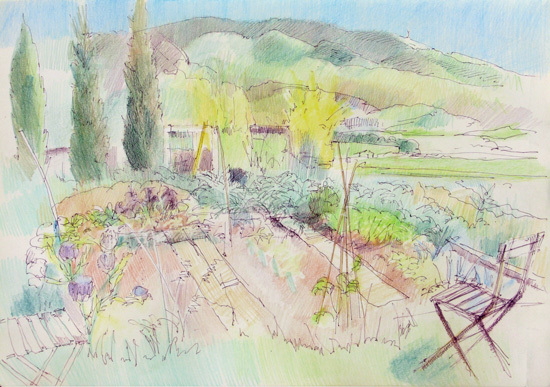 This is my sketch of her wonderful potager (a kitchen garden) at Couguieux with Mont Ventoux in the background. I never got round to posting it on this blog although it was posted to Four Go Painting In Provence. I absolutely adore kitchen gardens and can always be found wandering around them very slowly whenever I come across one! It was therefore a real joy to have one to look after and sketch during our stay in the Postcard from Provence house. I liked the fact that one had to walk a little way down the road to visit the potager - as we did every evening to water the vegetables. All the water had to be transported using a hose and/or watering can so it is no little effort to maintain such a garden under the hot Provencal sun. I sketched this potager just over three years ago. 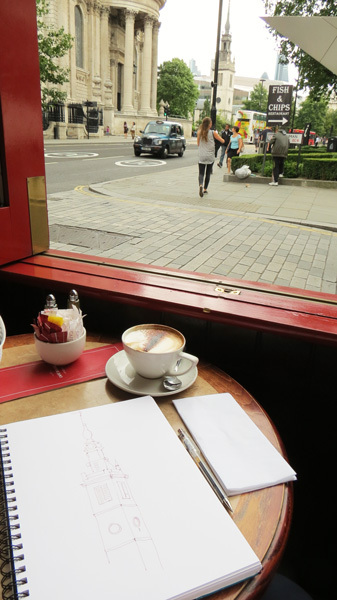 It was too hot to finish it and I really should have a go at doing a proper drawing of it as the view was wonderful. It was one of my first sketches using the very large A3 size Moleskine sketchbook which means I can do large sketches with no binding line down the middle of a double page spread! If you're interested in the sketchbook you can find out more here - The Largest Ever Moleskine Sketchbook! 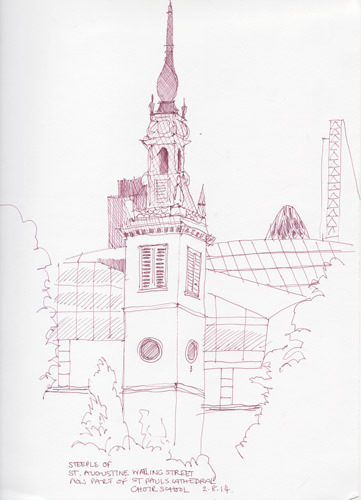 Earlier this month, on Saturday 2nd August, I spent the afternoon drawing three Wren churches as part of the Sketching Wren's London Sketchcrawl, organised by Pete Scully for Urban Sketchers London. The area I covered was very familiar being located very close to the Puddle Dock Offices in Victoria Street where I used to work when I was a management consultant at KPMG in the 90s. pen and ink and coloured pencil in Stillman and Birn Epsilon ringbound sketchbook, 9" x 12"
St Andrew by the Wardrobe is the last church designed by Sir Christopher Wren for the City of London. The original church (no longer standing) dates back to the 13th century and was associated with Baynard’s Castle, which used to be located where the Mermaid Theatre is now. The church was located close by to the place known as the The Great Wardrobe - where the state robes and other associated materials were stored. It was then damaged in the Blitz - it completely lost its interior - but has subsequently been restored. I've been sent some of the Stillman & Birn sketchbooks to review and this was the first time I'd taken out their Epsilon sketchbook (9 x 12" / 22.9cm x 30.5cm - ring bound / 100 pages). I'll be publishing a review when I've used it bit more - I'm only just getting back into sketching having spent most of the year writing my book about drawing and sketching! I really liked the paper which is heavy weight paper designed for pen and ink (100 lb. / 150 gsm - with a plate surface) and it certainly is an excellent surface for that. The other big advantage is that the pen and ink does not show through the paper so you can work both sides without causing a problem when it comes to scanning. 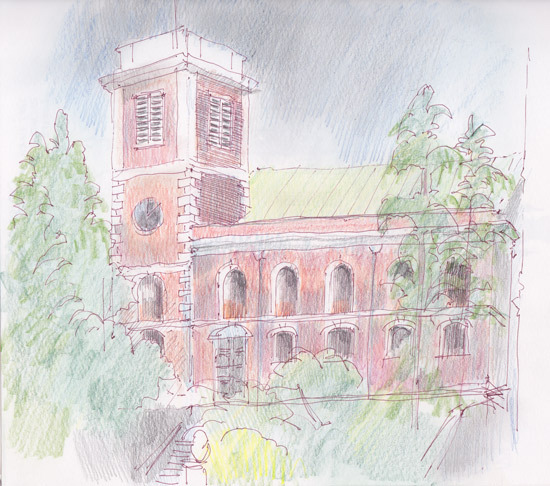 It also worked really well with coloured pencil as well and smudged beautifully when I used a tissue to blue the colours in the dark clouds behind the church. I'm much less keen on the ring binding as it causes a problem when it comes to scanning. I also need to remember that the sheets are 9" x 12" which means they're very slightly bigger in both dimensions than the A4 size permitted by my scanner. 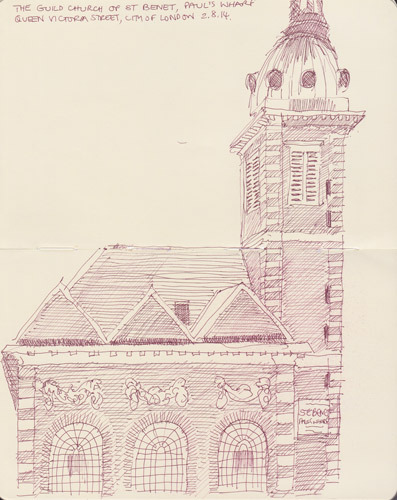 I then walked up the road and swopped to a pen and ink sketch of The Guild Church of St Benet, Paul's Wharf on a double page spread in my trusty Moleskine Sketchbook. This was drawn using an unusual 'portrait' format. I tried to get it all in but in the end lost the top of the tower. This is the Welsh Anglican Church in the City of London and has a Baroque style. It was originally located just to the east of the watergate of Baynard's Castle - and both castle and church burned down in the Great Fire of London. This 'new' church was designed by Wren and built between 1677 to 1685. This is the English Heritage listing for it. See if you can spot what they're referencing in my sketch (it's not all theer!). I was located to the north of the church - looking south towards the River Thames - which means west is on the right and east is on the left. Square compartment of 3 bays with north aisle and short west aisle to south of west tower. Exterior of red brick with modest dressings of painted stone and richly carved festoons above windows. Modillion eaves-cornice of timber. Hipped, tiled roof, in 3 sections to north aisle. Blind panel to centre of east front. Pedimented doorcase at south end of west aisle. Simple tower in 3 main stages with quoins, circular and round-arched windows and stone frames, simply mullioned belfry openings. Timber cornice capped by lead-covered cupola with lantern and weathervane. Flat ceiled interior has order of Corinthian pilasters and colonnades screening aisles, their high pedestals supporting galleries with carved fronts. Vestry (formerly entrance vestibule) beneath west gallery. Entrance now under tower. Fine, carved reredos communion table and rails, pulpit, west door, marble font with corner etc. Modest sword-rest. Wall tablets. Marble paving. Inscribed slabs. One of the least altered of Wren's churches. pen and sepia ink in Moleskine sketchbook, 10" x 8"
The last church I sketched - St Augustine, Watling Street - was one that doesn't actually exist any more. It's located to the east of St Paul's cathedral (visible in the photo on the right) in what used to be the cathedral's churchyard. The original church - located immediately to the east of St Paul's cathedral - dated back to the 12th century with the earliest recorded reference being in 1148. At the time it was 61 feet long. The church was destroyed by the Great Fire of London. It was then rebuilt to a design by Wren in 1682-1695. It was then destroyed again in the Blitz. All that was left after the Blitz was the tower and the steeple. This time rather than restoring what was damaged, it was left. Subsequently, starting in 1965, the tower and steeple were incorporated into the buildings which comprise the St Paul's Cathedral School - for the choir of boys who sing in the cathedral. pen and sepia ink in Stillman and Birn Epsilon ringbound sketchbook, 12" x 9"
This time I located the drawing of the Church's tower and steeple againt the more modern architecture which surrounds it. Immediately behind is One New Change - a new shopping complex. Beyond that is Richard Seifert's Tower 42 (which I still call the NatWest Tower), 30 St Mary Axe - better known as "the Gherkin" and 122 Leadehall Street aka the "Cheesegrater"
You wonder whether these designs would get built if the architects and those commissioning the buildings had any idea what they might become known as!